Bautista Alcañiz was born in Valencia, and formed part of the firm of Ribot and Alcañiz of Barcelona that was active at the end of the 19th and beginning of the 20th century. Nicolas Basil established himself on the Calle del Arch Nou de San Ramon del Call, 11 in 1926. He seems to have been one of the makers who like Enrique Sanfeliú was influenced by Enrique Garcia. The headstock of 1933 Nicolas Basil show here pays tribute to Garcia, and is described by its owner has having a similar "campanitas" sound. The rosette is similar to ones used by Sanfeliú. Cassas lived in Barcelona, and was active in the first half of the nineteenth century. Although Cassas first name has not come down to us, the Royal Conservatory of Brussels has an instrument of his in its collection. Agustín Altimira-Codina was a luthier in Barcelona born in 1805. He making both violins and guitars between 1837 and 1880. He studied violin making with the French luthier Etienne Marie Breton (1827-1895) who in 1850 came from France to take charge of Altimira's workshop, and worked with Agustín until 1874. Agustín had his workshop first on the calle de Escudiller where Fernando Sor lived as a child. In 1860, he moved to La Plazuela de San Francisco. His early guitars were heavily influenced by the Mirecourt school in France, and so made no use of fan bracing. In later instruments he used fan bracing. In 1878, he exhibited a highly decorated guitar at the Paris Exposition, winning a silver medal. Altimira's guitars were influenced by Torres and Arias. He died in 1884. Enrique Coll was a guitar maker of classical and flamenco guitars active in Barcelona during the 1940s. He was trained by Francisco Simplicio. He had his workshop on the calle Caspe, no. 35. Nicolas Duclos was a French luthier who was moved to Spain and was active in Madrid and Barcelona between 1766-and 1781. In addition to violins, he made mandolins and guitars. Francisco Pedro España was born in 1793 in San Juan les Fonts in the province of Gerona. About 1820, he studied with the French luthier Thérèse from Mirecourt with whom he continued to work until 1835. He seems to have been a very successful luthier who ran workshop that employed a number of luthiers. In addition to violins, violas, cellos, double basses, and even pianos that bear his label, he made highly decorated guitars made from exotic woods. Juan Estruch Pipó, a Barcelona luthier, is the grandson and successor of Juan Estruch Sasate. Juan Estruch Sasate, a Barcelona luthier, was the son and successor of Juan Estruch Rosell. Juan Fenoy was trained by Miguel Simplicio. 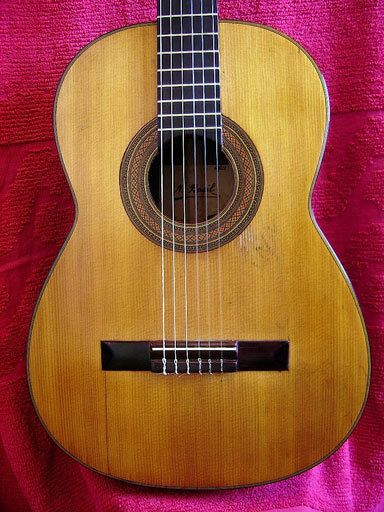 He produced Torres copies, not to defraud, but to prove he was as good luthier as Antonio de Torres. Bienviendo Fleta was the eldest of three Fleta brothers. He was born in Huesca, but was influenced by his brothers Francisco Manuel (1890-1981) and Ignacio (1897-1977) to become a luthier. He joinedhis brothers Francisco Manuel and Ignacio in Barcelona after they opened a workshop in 1915. He was trained by Francisco Manuel. Ignacio Fleta (Barcelona b. 1897 d. 1977). Francisco Manuel Fleta was born in Huesca in 1890. He made his first violin at the age of 15. Recognizing his son's interests and talents, his father arranged for him to apprentice with Benito Jaume (1860-1934), a violin maker in Barcelona. Francisco Manuel studied with Benito Jaume for three years, and later continued to perfect his skills studying with Etienne Marie (1867-1935). In 1915, he opened his own shop in Barcelona. Francisco Manuel trained his brothers Ignacio and Bienvenido. Like Ignacio in the mid-1920s, Francisco Manuel also went to France to study with Philippe Le Duc. Francisco Manuel's violins and cellos are modeled on those of Stradivarius, but in addition to these stringed instruments, he also built guitars and contrabasses. José Massí Forner was a Barcelona guitar maker. He died in 1991. Juan Maria Garcia seems from the style of this guitar to have been active in Barcelona in the late 19th to the beginning of the 20th century. His label reads JUAN MARIA GARCIA / Fabrica de Guitarras y Bandurrias / BARCELONA / Plaza de San Pedro No 403. Francisco Istrell was a luthier who made guitars in Barcelona circa 1685. José Massague was born in 1690 in Barcelona. He belonged to a carpenter's guild in Barcelona, but also made guitars and violins. His workshop was on the calle de Escudillers. He worked as an independent maker from 1725 until his death in 1764. Francisco Matabosch was a luthier active in Barcelona in the second half of the eighteenth century. Joan Matabosch was a Barcelona maker active at the beginning of the 19th century, and was probably the son of Francisco Matabosch. The only guitar of his known to have survived is in the Museu de la Musica in Barcelona. It is dated 1815. Matabosch was among the important guitar makers in the late eighteenth century Spain. Fernando Sor's first guitar was built by Matabosch. Dionisio Aguado also mentions in his memoirs that among his collection of instruments that he owned was a fine, well-made guitar by Joan Matabosch. Salvio Morbey was a luthier in Barcelona in the late part of the nineteenth century. He built very ornate guitars typical of the period. Ramón Parramón Castany was born in Montesquiu, Barcelona in 1880. He opened his workshop in Barcelona in 1908. In 1920, Jacinto Pinto joined Ramón's workshop. Jacinto was a luthier who had studied with Laberte and Magnié in Mirecourt, France and had spent several year with the Etablissements Couesnon in Paris. Despite the label R. Parramón, after 1921 all the firm's instruments were in fact made by Jacinto Pinto. In addition to violins and other bowed instruments, they made guitars as well as reproductions of early instruments. Ramón died in 1955 and Jacinto died in 1956. Pedro Pérez was a luthier in Barcelona active at the beginning of the twentieth century. He had his shop on the calle Gobernador No. 3, piso 4. Jaime Ribot was a luthier in Barcelona at the beginning of the twentieth century who shared a workshop with Bautista Alcañiz on the calle Ancha until 1920. In addition to classical and flamenco guitars, he also made bandurrias. Juan Ribot was the son of Jaime Ribot, and trained by his father. He was an excellent luthier, but unfortunately he was still a young man when he died in 1918. José Serratosa Blanch was born in Tarrasa in the province of Cataluña in 1855. As a youth he apprenticed as a carpenter, but being temperamentally studious, he was drawn to the challenges of making flamenco and classical guitars. In 1890, he moved to Barcelona and opened a workshop where he continued working for the next forty years. Among his inventions was a guitar that had a detachable neck. Francisco Simplicio was born in Barcelona in 1874. As a youth he apprenticed as a cabinet maker in the Casa Masriera y Vidal, and later with Francisco Vidal, a workshop that produced fine furniture, and soon earned the position of a master craftsman with this firm. Francisco worked as a cabinet maker for some eighteen years. Around 1919, a series of labor disputes between owners and workers that led to a lock out, Simplicio was forced to seek other employment. Based on their longstanding friendship, Francisco was able to find work in shop of Enrique Garcia, who one of many fine luthiers to come out of Manuel Ramirez's shop. Simplicio under Garcia tutelage soon became a master craftsman. When Enrique Garcia died in 1923, he left his shop on Paseo San Juan 110 to Francisco. In 1929, Simplicio exhibited some of his guitars at the International Exhibition in Barcelona, winning a gold medal. During his life he produced around 340 instruments. Although Simplicio took pride in being the disciple of Enrique Garcia, he was also an innovative maker in his own right. Perhaps, the best known of his experiment was a guitar with a double sound hole placed on each side of the fingerboard. By moving the sound hole from its usual position, he sought to increase the vibrating surface, and thus enhance both volume and tone. He died in Barcelona in 1932. He trained Enrique Coll and his son, Miguel Simplicio, who took over his father's shop after his death. Photo courtesy of: " Il Fronimo", nr. 113 - Genuary 2001, "Francisco e Miguel Simplicio, in arte liutai" by D. Milanese and U. Piazza. Miguel Simplicio, the son of Francisco Simplicio was born in 1899, and was trained both by his father and Enrique Garcia. During his father's life they worked closely together. After his father's death, he took over his workshop, and quickly gained an international reputation, particularly in Latin America. During his lifetime, his guitars sold for fabulous prices in Argentina. Although he is credited with the production of some 150 guitars under his own label, it seems he had a hand in much of his father's production. He died of stomach cancer in 1938 at the age of 39. He trained Juan Fenoy. Juan Valenzano (Barcelona, active c. 1771-1825). Juan Valenzano was a luthier active in Barcelona at the beginning of the nineteenth century. Born Giovanni Maria Valenzano, this Italian born luthier was somewhat of a vagabond. From his labels we know that he lived for times in Italy, France, and Spain. Sometime between 1771 and 1805 he move from Padua to Valencia. In 1809, he moved to Barcelona, then to Montpellier in 1813, to Marseille and Nice in 1815, then to Trieste and finally to Rome where he died in 1825. He also used the following names in his guitars and other instruments: Johannes Maria Valenzano, Johannes Valenzano, Johann Valenzano.